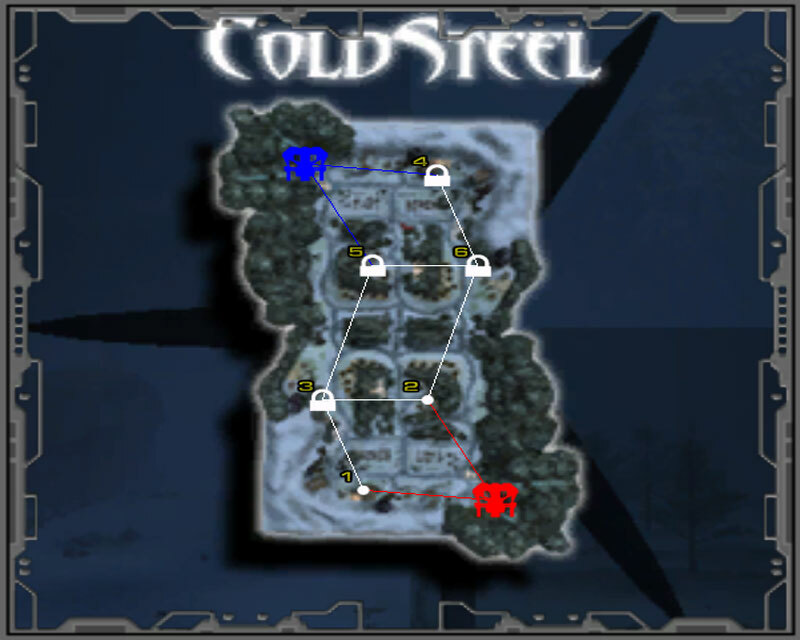 ColdSteel: both the map, and what you'll be slamming together when playing with the vehicles in the map. Set in a cold mountain valley before the onlaught of winter takes its toll on the residents, you will be as you pilot the many vehicles around the map. Oddly enough, the nicely made windmills don't power the log cabins, as would be expected - instead the resident rely on fire to heat themselves - at least that's what the smoke coming out the smokestacks suggests. At any rate, onto the review. 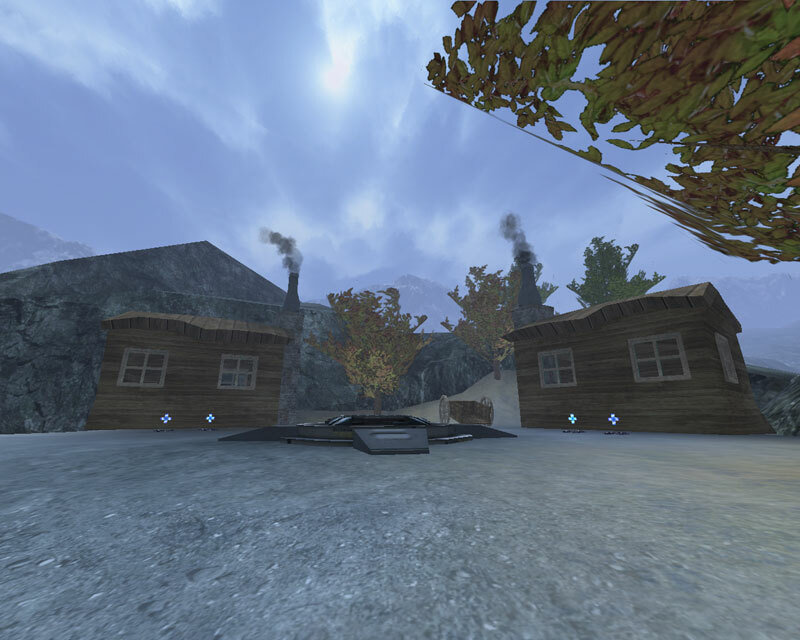 Kantham has included custom textures and meshes for this map - some borrowed, some made by himself. Most of the meshes are well done, although some more attention to detail on the log cabins and some of the wood would have been appreciated. There's some stretching on the cabins exteriors, and much stretching on the interiors. Although you cannot enter the cabins, you can look into them and see the un-uv'd faces. Most of the wood is uv'd well, but there are some instances where the texture, or the uv, should have been rotated 90� so the grain could properly follow the board. Aside from these faults, the custom materials look really good. Since this is a mostly terrain map, the only other textureing is on the terrain itself, and I must say I'm quite fond of the grass textures that bleed through the snow from time to time. In terms of lighting, well, it's mostly just a wash. The lighting seems very much 'ambient' and the 'spot' lighting provided by flashlights mostly doesn't look right. Instead of a corona, and a single light actor, I think a combination of non-incidence and cylinder lighting could have increased the 'beleivability' of the flashlight beams. Other than that, the entire place is adequately lit - but with almost no shadow work. I would have loved to have seen some shadows cast by the rocks, windmills, towers, cabins, etc.. onto the terrain. Finally, in terms of architecture, it's nicely put together as whole, but nothing really stands out, except for the windmills, which, honestly, don't really seem like they're integral to the map's theme. It seems like the map could do without them and suffer almost nothing from their removal. The log cabins are nicely integrated into the map, clustered in amoungst the rocks as if seeking shelter from the wind. My only big theme complaint is that the waterfalls look a little unfinished. Where the water hits the rocks below - and not just the pool - should have had spray as well. In general, it's a nice theme overall, it just seems very underdeveloped in terms of lighting, and a litle underdeveloped in terms of integrating the windmills into the setting. It's competantly done, but lacks the extra little effort to make it stand out. The brushwork is minimal, as befits the standard 'terrain-based' onslaught map. Althoguhg I am confused by the one addition brush running across the center. Perhaps this was to occlude netowrk actors? Also, there are no antiportals - I expected to find some buried in the outcrops. But honestly, the frames all over the map are fine, and they aren't really needed. However, perhaps they would have been useful for those times when the player load goes very high. Collisions for trees have been replaced with simple cylinders so as to keep the vehicles moving, which is good. The landmine actors work well - especially well when playing the map for the first time and you don't know that they're there. :) The pathing is good and the bots will travel all over the map both on foot and in vehicles. The ambient sounds are adquate, but like some of the visuals, lack the final polish the would have been a great addition. Fast winds over the high points in the map, hollow, deep, slow winds in the lowest parts, these would have been really nice to hear, but are sadly absent. Some triggered sounds on the wood boards around the map would also have made a nice addition to the soundscape. To sum it up, it's fiarly well built. But again, some lack of attention to detail to sound and pehaps optimization hurt the score overall. The gameplay is a bit of a mixed bag. First off, there are little to no 'long shots' so pamming an out of view (because of fog) is not an option, which is good. Also good is that the node layout does not provide a chokepoint, which means no long, drawn out fight over 1 node. nothing significant to defend with. In fact, the best defense is to grab a fast but light vehicle and try to take down both connecting nodes. Unless you have a highly organized team, this will lead to very short endgames. Finally, the vehcile spread in general is lopsided towards scorpians. There are just too many on the map. In general, it's a fun little map, but with enough flaws to keep the 'serious' players away. The map flows well, the node setup is good, and overall it just plays well. But with the downsides taken into consideration, it's more of a casual map than one that will do well online. some fun time in, but only the onslaught collectors will keep it in their possesion for a long time. The windmills, the signs and the skybox own. The other custom stuff needs some more work. The layout is good, but the placement could have been a bit better (needs some playerstarts beside the vehicles that are too far from the nodes, most of the nodes have too many healths and weapons...) The bots play well. Good map theme and decent gameplay. Worth a download. best map for sure. hes getting good. I don't play alot Onslaught but I'll check this one out anyway. Unless this was a submission for DM-Coldsteel?? Check your game, you have something messed up and after you fix your game, then come and place a score.